300 Seniors In Chinatown Escape Steep Rent Hike, But What About Everyone Else? By any metric, the nine-story Metro at Chinatown Senior Loft building is what Southern California desperately needs more of. The publicly subsidized 123-unit building rents apartments at below-market rates for low-income seniors. But when the building's owner told tenants last month that rent would be going up by 8 percent, it panicked the largely fixed-income seniors who call the building home. They organized, launched a protest campaign aimed at their building's owner, and appealed to Councilmember Gil Cedillo's office for help. On Thursday, Cedillo came through, helping to broker a deal to keep the rents lower. While that's great news for the roughly 300 residents of the Metro at Chinatown Senior Lofts, the crisis — and its piecemeal solution — underscore the greater problems facing a region with too few affordable housing units. WHY WAS THE RENT GOING UP AT ALL? Although the building is subsidized for low-income tenants, its rental rates are based on a formula. That formula is set using the federally calculated median income for Los Angeles County. Last year, that median income went up by about $5,000. A rise in incomes might seem like good news, but the increase also triggered re-evaluation of rents in subsidized residential buildings. Cedillo also said other factors were also at play, including higher operating costs for the city's apartment waste and recycling program RecycLA. That rent increase was enough to make the affordable apartments unaffordable for some living there. 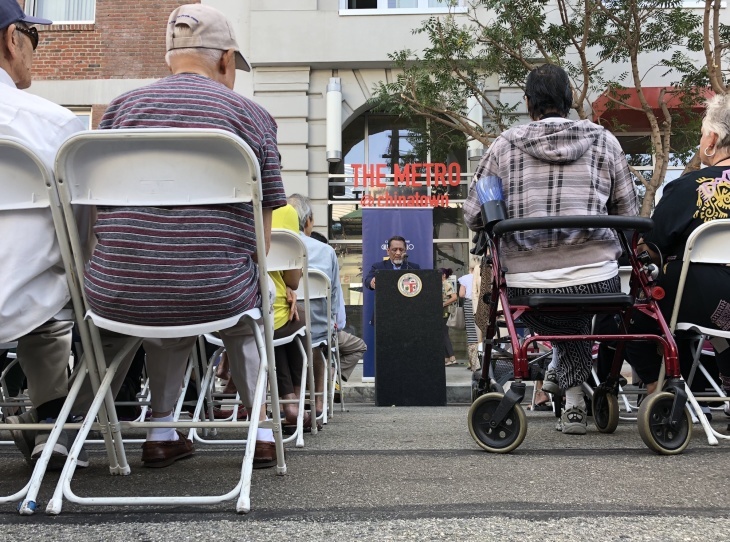 At a protest demonstration outside of Meta Housing's West LA office earlier this month, tenants said their new rental bills would have exceeded their monthly income. Many in the building rely solely on their monthly Social Security checks. "It's just like how some of the people who work are one paycheck away from being homeless," explained Cliftoen Griffin, a resident of the building in his 70s. "We're in a place, and we're still one more rent-raise away from being put out of our buildings. There are so many homeless out here, this is why. The rent is too high." The money needed to stop the rent hike will come from another development company with plans to build nearby. The estimated cost of the subsidy is $500,000 over the next 10 years, and is contingent on the 770-unit project known as College Station moving forward. "We worked with our friends here at Meta Housing, with our new neighbors Atlas Capital Group, talking to you, listening to your needs. I want to say to all, there will be no rent increases for you," said Cedillo, to cheers from those gathered Thursday. WHAT ABOUT ALL THE OTHER POOR PEOPLE PAYING HIGH RENTS? Cedillo said that coaxing developers to subsidize existing units in buildings they did not build might be a tenable solution to the region's housing crisis. He pointed to another example in his district. In that project, Curbed LA reported the developer behind a 41-story tower-to-be in Westlake agreed to contribute $2 million for a nearby 60-unit SRO building. That building, La Posada, helps single women and their children. "I believe there are enough resources in the City of L.A. and Southern California to address these concerns," Cedillo said. "It's a question of how we organize ourselves, and how we access them." Cedillo, who also chairs the L.A. City Council's Housing Committee, acknowledged longer-term issues remain unresolved by this one deal: "We have a high cost for rent, and a low-wage city. We're challenged to reconcile that." In L.A.'s last homeless count, officials were caught "off guard" by a 22 percent increase in the number of new homeless people older than aged 62 and up. It's an increase that Ruth Schwartz, the co-founder and executive director of non-profit homeless policy organization Shelter Partnership, traces to increasing housing costs squeezing out people already squeaking by. "Most seniors can't go anywhere else. They're on fixed-incomes. They're not working, yet the cost of living is increasing," said Schwartz. "When costs go up and incomes are flat, even a small increase can knock some people off their feet." Residents of the Chinatown building already were more fortunate than many other seniors living in Southern California, she said. "In a sense, these people are the lucky ones," said Schwartz. "The majority of senior renters in L.A. don't have any subsidy. And if they live in a non-rent-controlled city, the landlord can increase rent to whatever they choose." Julie Rico, a building resident, said she and her neighbors are well aware of how vulnerable they are. "None of these people who are retired at that age can find income elsewhere," Rico said. "If we hadn't mounted a protest, they would have incurred that rent increase and some of them would have been kicked out of the apartment building." Griffin, her fellow resident, said it's the reality they're all living. "The elderly have to lean back on their children or family members to have a place to stay to keep from being homeless," he said.